July 2018 TD Authors: What's on Your Bookshelf? Know when and how to use microlearning to deliver big results. How do you eat an elephant? If you are familiar with this old colloquium, you know the answer is one bite at a time. This common turn of a phrase is meant to help the overstressed individual realize he needs to break down his initiative, project, or program into smaller pieces—much like microlearning is bite-size. Continuing this metaphor into microlearning, the symbolic elephant is also known for never forgetting, and microlearning advocates claim it's an effective method for reinforcing memory and aiding recall. Research supports these conclusions in terms of learners being able to recall information when it is provided in small chunks over time as opposed to providing a dump of information in a concentrated time frame—for example, an hour-long e-learning module on company safety procedures. While the concept of microlearning has been around for a while, the advent of mobile technology with improved networks for lightning-fast Internet produced a perfect mechanism for delivering content anywhere. This gave a new take on providing small, focused amounts of content to learners over time or even just in time. action-oriented in the sense that there is a specific achievable purpose or goal. Another reason for microlearning's appeal is that employees seem to be highly receptive to learning delivered via smartphones, not to mention that immediacy is a commodity pervasive in the consumer culture. This lends to microlearning being absorbed quickly into the rhythm of work. Therefore, microlearning is attractive because it can be consumed quickly, aids with recall, and can easily fit into performing on the job. 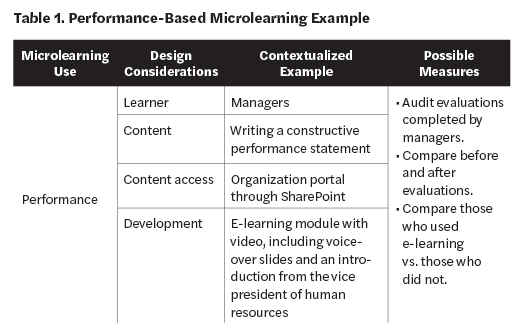 Four uses for microlearning—performance, persuasive, post-instruction, and preparation (the four Ps)—exemplify its key characteristics while giving varied and modern approaches to supporting employees everywhere in their respective work environments. Performance-based microlearning. This first use for microlearning is seen as just in time or at the point of need—for example, completing a company mileage report or the company's policy and expectations for holding web-based conference calls. Microlearning doesn't always have to be cognitively focused content either. For instance, performance also can have an affective domain emphasis, or it could be a mixture of affective and cognitive content—such as how to write a constructive performance statement for a performance evaluation, as elaborated in Table 1. 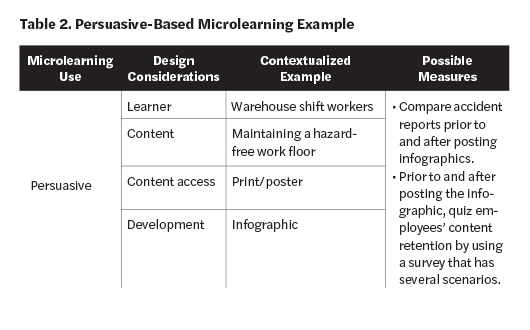 This table, and each subsequent one, provides an example of a work-related situation where the type of microlearning could be applied. The first column is the type, the second column highlights four design considerations, the third column provides a contextualized example to those considerations, and the final column provides suggested measures to evaluate the success of the microlearning. Persuasive-based microlearning. The persuasive use for microlearning is meant to modify the learner's behavior and is usually goal oriented—for example, applying an objection-handling technique for a sales representative. In turn, the goal is to not only use the method in a sales call but be successful in using it. Another example is using hand sanitizer before seeing a patient. The goal here is to reduce the transmission of bacteria and germs. 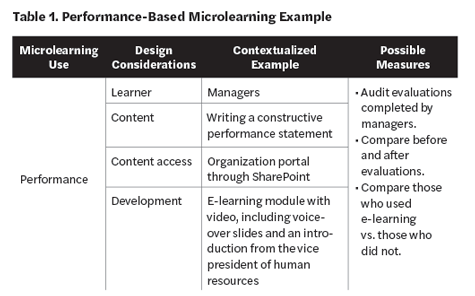 This use of microlearning works well in tying performance to the organization's strategic outcomes. 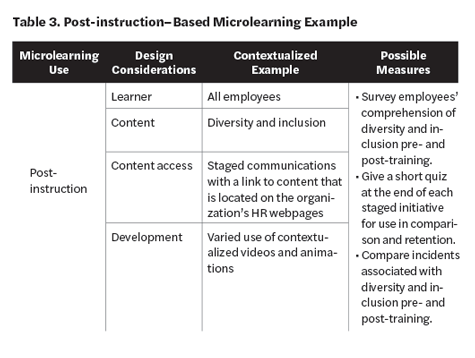 Post-instruction microlearning. Post-instruction complements a larger training program that a learner has completed. This type of microlearning distills the key concepts from the larger training course into bite-size pieces for use in refreshing the learner, whether scheduled by the organization or available readily to learners. For instance, trainees for a new nightclub may be given a small card to carry that highlights characteristics of a fake ID, information taken from a larger training course on the legal responsibilities of their job role. Or a lab tech employee may want to review procedures on how to report a spill. The procedures were part of a comprehensive training course on lab management. Preparation-based microlearning. Preparation provides an opportunity to set up a series of planned learning initiatives to prepare for a larger learning event. This could be a content refresher or new, general content. Either way, learners would all have equal understanding prior to executing the larger learning program. Microlearning is not the new panacea for learning. There are times when breaking down a subject or skill is going to compromise the overarching goal of what an individual should learn. If you want to teach deep learning, such as problem solving or strategic thinking, microlearning is not the right tool. However, it makes a great deal of sense to integrate microlearning elements into a larger curriculum or because of learner retention and ease of access. Complex skill development. Time and experience are integral to skill development. Strong leaders are not made overnight. However, microlearning is a great way to highlight important leader attributes, such as active listening or time management. Conceptual wholes. Sometimes the big picture and its relevant parts are better off together rather than being broken down too far. An oral hygienist student learning about the pathology of gum disease is going to have a hard time recalling the various anatomic and physiological aspects related to it if microlearning is used for the entire subject. But using microlearning to reinforce medical terms or dental anatomy can help keep key knowledge fresh while the students study the whole of gum disease. Context. Certain environments necessitate more than what microlearning can offer. A trainee learning how to operate a forklift safely is not going to want to learn how to do so in short bursts, let alone off the work floor. However, microlearning may be an effective method to introduce the forklift and its parts prior to the trainee taking an in-person course on operating it. Watching a video demonstrating a safe maneuver can support a new forklift operator, but much like the first point, she needs time and experience on the equipment. In looking at converting content, don't consider microlearning "shrunken head" education. This means you cannot take an existing course and shrink it down to fit onto a smartphone. Courses originally designed for a desktop environment are not going to be ideal for the phone or the learner (and his learning). From an interface and user-engagement perspective, the text will be tiny, images will lack optimization for viewing, and navigation will be difficult and cumbersome. Learners will be left to constantly stretch or shrink the screen with their fingers in attempt to gather all information on the topic. The worst part is that the content will not have been redesigned to fit the new approach, which will create problems with learning effectiveness. This increases the potential for learners to miss content and not recognize important contexts or other strategies that were applied to the content. 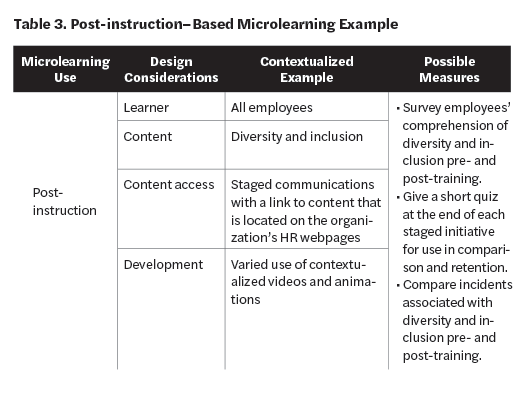 Delivering educational materials via microlearning requires designing or, in some cases, redesigning to fit the microlearning method. Cost: What type of budget is available? For creation? To sustain or perpetuate more Ps being developed? Time: When does the training content need to be released? Does it have an internal or external review process? Quality: Does the information need realistic elements, such as actors and sets? Is there content that requires complex elaborations? Using the persuasive example from earlier, the infographic is low cost and fairly quick to develop. However, the quality of the design and the presentation of the content could be less than ideal because of budget or time. It also could be of high quality for the same reasons. The takeaway here is that you should not see microlearning as a plug-and-play option that you can create overnight. As with any educational product, follow instructional principles, such as analysis, to determine which of the four Ps will work given variables like financial resources or learning environments. With any new trend, there are always triumphs and potential downfalls. Microlearning is still the new kid on the block. It continues to show great potential as more organizations and educational institutions innovatively use microlearning for their performance and academic challenges. 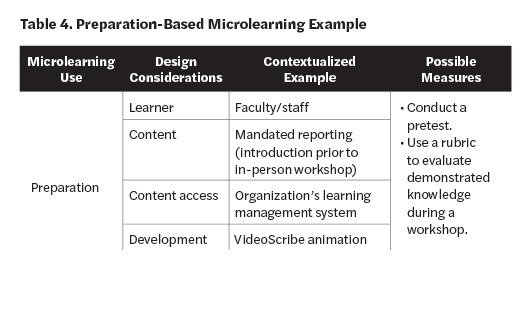 On demand—microlearning is available for learners when they need it. Scheduled—microlearning is released based on a timeline. Also, microlearning can be woven into larger learning or it can stand alone as a series or collection. Though microlearning is discouraged for teaching overly complex topics, it can still be packaged as a comprehensive solution. The microlearning elephant is large and has many pieces, such as tusks, a trunk, and feet. All the pieces may not be the same, but they are all related—just like the interrelated aspects of determining the applicability of microlearning for your organization. Determining its use is not simply ensuring the training content is appropriate but that the need fits in one of the Ps of microlearning and to the budget, timeline, and so on. Careful consideration of these variables when evaluating microlearning for its implementation value will ensure the elephant is eaten. Wow, I was already a fan of micro-learning, but the 4 Ps and your examples are fantastic. Thanks so much! Thank you Robin! I hope the examples demonstrate how easy it can be to keep learning "alive" even in the most unique environments! What we're aiming for at my organization is to convert to microlearning, for the most part. A benefit we see is allowing learners to return to our materials as they are working (for just-in-time training) and allowing them to assemble their own curriculum to create a more traditional course experience, when desired. The main problem we've found is that we can't find an LMS set up to handle this. They are all structured for a more traditional course experience. Any advice on solutions? Oh! I wanted to say "kudos" for providing both formal learning and organic learning opportunities! It's fantastic you are trying to find a way for your learners to be able to keep track of their own personal learning. Eventually, that can be shared as well, as sometimes peer-to-peer learning can make a big impact too!